Whereable Technologies uses u-blox technology for the first live-monitored personal safety wearable that doesn’t require connection to a cell phone. RiskBand, which launches in fall, 2016, is a small, bracelet-like device that allows wearers to summon help and stream audio and photos with just one discreet push of a button. 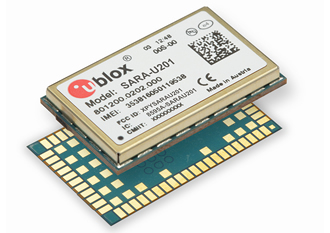 It will use u-blox’s SARA-U201, the world’s tiniest penta-band HSPA/GSM cellular module, so wearers can reach the RiskBand Emergency Response team from anywhere on the planet that has cellular service. RiskBand will be one of the first devices to incorporate this globally functioning cellular module. Measuring just 16x26x3mm, the 96‑pin SARA‑U201 is the smallest cellular module ever made supporting both 2G and 3G connectivity and has global radio regulatory approvals. RiskBand will also incorporate u-blox’s top of the line GPS smart-antenna module with omni-directional reception in its device to ensure its location-based functions are best in class as well.